I've been on this huge Belgian kick recently, probably my last 7 or 8 beers have been Saisons, Tripels or Gueuzes. With the weather warming up I think weather is almost perfect for Tripels. Tonight I'm reviewing a real classic; Brouwerij Westmalle's Tripel. The Westmalle beers are brewed at Our Lady of the Sacred Heart monastery right near the town of the same name. 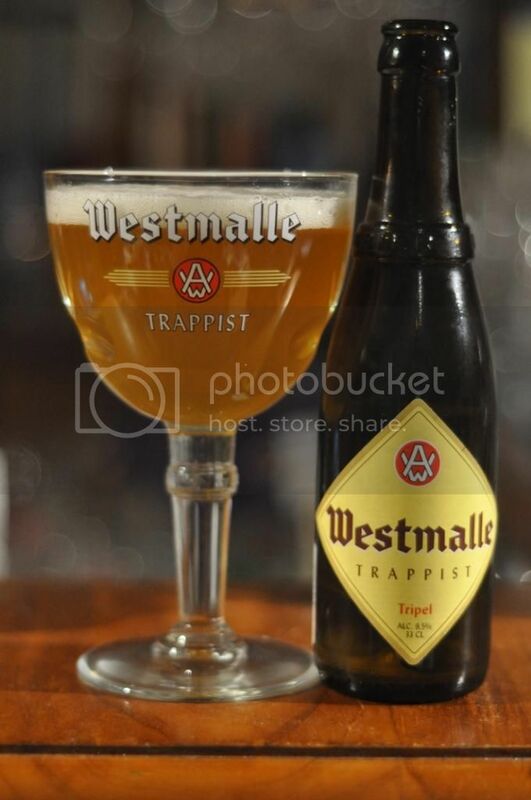 Many experts credit the Westmalle brewery with inventing the modern day Tripel in 1934. Beers in this ABV range (typically 7.5-10%) existed previously, but would have been dark. Westmalle Tripel revolutionized this with the introduction of pale malts. Supposedly the recipe has only been reformulated once, in 1956, since it's inception. Westmalle Tripel pours the distinctive golden colour that had become the standard of Tripels worldwide. On top of this fantastic looking beer is a relatively small head of white foam. The head has a relatively short lifespan once poured, which I found a little unusual, especially with plenty of tiny carbonation bubbles rising to the surface. Even without he head it's a pretty looking beer. Onto the nose and it's quite clearly yeast driven, with the spiciness one of the dominant elements of the nose. There is also plenty of fruitiness with apricot and banana the main protagonists. It's a sweet smelling beer with candi sugar another quite prominent aroma. Westmalle Tripel has a very complex nose that this review has in no way done justice to. I've always though that the Westmalle Tripel was a little light on fruit flavours compared to other Tripels. This proved the case tonight, although there were banana, apricot and peach flavours all present. The sweetness mostly comes from candi sugar, although again it is less intense than others from the style. The thing that makes Westmalle Tripel stand out is the spiciness with pepper and cloves both prominent. It's also one of the few beers where the relatively obvious booziness doesn't worry me - it's just so well incorporated with the rest of the beer that it doesn't feel out of place. Westmalle Tripel is not only the original Tripel, but in my mind it is the best! The combination of fruitiness and yeasty spiciness is unsurpassed. No review could ever do justice to this magnificent beer, it's one that you really have to experience for your self! With summer coming round here I think everyone should grab at least one of these. Barring the high ABV Tripels are the perfect summer refresher; and Westmalle's is probably the best of the lot!